Mexicans set fire to an effigy of US Republican presidential candidate Donald Trump on March 26, 2016 in Mexico City during Holy Week celebrations. For many years Mexicans have made cardboard figures representing all forms of evil, which are then torched commemorating the "Burning of Judas," a tradition in which Mexicans torch effigies of the devil, politicians and others they dislike on the eve of Easter Sunday. Mexicans celebrating an Easter ritual late Saturday burnt effigies of Republican presidential front-runner Donald Trump, whose anti-immigrant views have sparked outrage south of the American border, NBC News reported. In Mexico City's poor La Merced neighborhood, hundreds of cheering residents yelled "death" and various insults as they watched the explosion of the grinning papier-mâché mock-up of the real estate tycoon, replete with blue blazer, red tie and his trademark tuft of blond hair. Media reported that Trump effigies burned across Mexico, from Puebla to Mexico's industrial hub Monterrey. 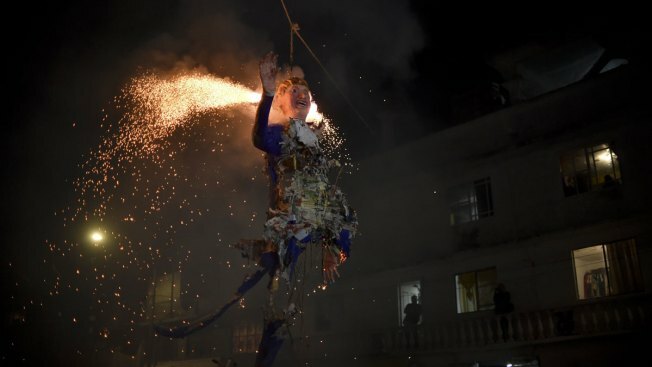 The burning is part of a widespread Mexican Holy Week tradition where neighborhoods burn effigies to represent Judas Iscariot, who betrayed Jesus Christ according to the Bible. The effigies are often modeled on unpopular political figures.